ASUS X99 'OC Socket' Motherboard Short Circuits - Is AIB Socket Modification Safe? ASUS X99 ‘OC Socket’ Motherboard Short Circuits – Is AIB Socket Modification Safe? You might remember that a couple of days ago, I did a short write up on the ASUS ‘OC Socket’ in which I detailed this particular LGA 2011 socket (which isn’t LGA 2011 at all). Well, in the same ed, I mentioned that the ASUS ‘OC Socket’ will most probably be unstable at launch. Sadly however, Nathan over at Legit Reviews didn’t read my write up (just kidding) because his ASUS X99 Deluxe short circuited. For those of you who arent aware the ASUS OC Socket is a proprietary socket which has more than 2011 pins. Which means that the socket isn’t technically LGA 2011-3, rather compatible with 2011-3. The correct nomenclature would be 2011 + the number of pins ASUS has added. The extra pins allow ASUS to bypass FIVR restrictions that Intel has in place (pay very close attention to this part) along with DDR4 voltage regulation among other things. These things do ofcourse allow for a more stable and higher overclock, but like I mentioned and emphasized many times, it was highly probable that the first batch would have serious bugs and issues. My skepticism arose from the fact that ASUS has basically invented a new socket, and done this by reverse engineering (assuming Intel wasn’t involved in the making of the OC Socket) alone, since the voltage lines are hidden from AIBs since recent times. Now the ASUS X99 Deluxe motherboard that got fried also had the OC socket and the exact components that were fried seem to confirm my suspicion. Quoting Nathan, “clearly it was a failure of CPU voltage regulation system and one of the eight 60 Amp phases (Dr. MOS IOR 3550M mosfets) has appeared to fail…. 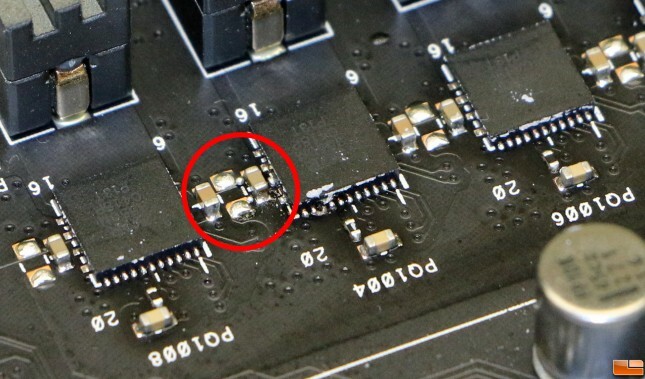 the failed component in question is part of the PQ1004, which is part of the VCCIN or basically the processor input voltage.” We already know that the OC Socket works by accessing the voltage lines and bypassing the FIVR on Haswell-E and we also know that the component that got fried on the ASUS X99 Deluxe was related to CPU voltage. Coincidence? Improbable. To be fair to ASUS there exists an alternative explanation since Michael over at Phoronix.com had a similar experience. His X99 Mobo short circuited too, albeit at a different component. This means there is no way anyone can conclusively pinpoint this matter on the OC Socket. This really is a brilliant innovation, and I hope this goes on to become a trend setter. However, ASUS’ warranty should cover any damages that arise from using experimental sockets such as the OC Socket.